Crimp Covers .925 Sterling Silver 3mm, anti-tarnish finished. 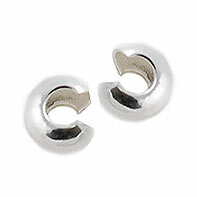 Use these crimp cover to put a finished look to your jewelry. Easy-to-use, simply put the open end over already crimped crimp and close it down with your favorite tool. Sol per piece.